All growth is good. Bigger is better. All businesses must either “grow or die.” If you’re a small business owner, you might have been nodding along as you read those business mantras, agreeing wholeheartedly with each one. After all, it’s what you’ve always been taught. And in fact, these popular business axioms are routinely lauded on Wall Street, at business schools, and by some of the most well-respected business consultants of the day. Few question their validity. But according to Professor Ed Hess, these “truths” are anything but. “At best those beliefs are half-truths and at worst they’re pure fiction,” says Hess, author of the new book Grow to Greatness: Smart Growth for Entrepreneurial Businesses. “Growth can be good and growth can be bad. Bigger can be good and bigger can be bad. In Grow to Greatness, Hess explains how such myths came to define the way growth is approached by entrepreneurs—often to their detriment. The book lays out a framework for how to approach business development—and how to manage its risks and pace. The best way to illustrate the downside of growth, says Hess, is by looking at well-known public companies. Hess has spent much of his career studying how growth affects businesses. In a recent study of 54 high growth private companies, he learned that several of the successful entrepreneurs in the study were repeat entrepreneurs who had “imploded” their first business by taking on too much growth too quickly. Growth overwhelmed them. They learned to respect growth’s destructive ability, and in their second venture they paced growth so that it did not overwhelm their people, processes, and controls. “That is what I call the ‘gas pedal’ approach to managing growth,” notes Hess. “Let up on the growth gas pedal as needed to give your people, processes, and controls time to catch up. Growth is change (and change isn’t easy). There are limits to an individual’s and an organization’s ability to process change. Growth requires the entrepreneur to install more processes, procedures, controls, and measurement systems. The right processes and controls must be put in place and taught to employees. In addition, the right information needs to reach the manager regarding variances from processes and controls so mistakes can be fixed quickly and do not escalate into a larger problem. Growth is evolutionary. Sometimes tough decisions are required if you’re going to keep up. Growth requires the evolution of the entrepreneur and the management team and more sophisticated processes and controls. Often, if not always, the business model and customer value proposition evolve, too. Furthermore, this evolution is continuous, and anticipating and responding to it can require making some fairly dramatic—and difficult—changes. “One surprising finding of my research was that companies frequently had to upgrade their management teams as they grew,” explains Hess. “Often managers who operated effectively at one revenue level of the business were unable to manage effectively at a much higher revenue level. The jobs simply outgrew their skills. Growth requires continuous learning and constant improvement. The entrepreneur and employees must be constantly open to learning and adapting and improving in an incremental, iterative, and experimental manner. No matter how big you get or want to get, continuous improvement is required. “Every entrepreneur has limited resources and time,” says Hess. “To be successful, businesses must prioritize their focus. This is critical because any growing business has resource constraints: limited people, time, and capital. So it is critical that the entrepreneur spend his or her time on the most important areas that can drive success. These priorities, however, may vary with the type of business or the phase of growth. Growth is process intensive. Growth requires implementing processes, which include controls. Processes are like recipes for baking a cake. They are the step-by-step instructions for how to do a task. Processes are necessary to hire employees and train them, to minimize mistakes and institutionalize quality standards, and to deliver products and services on time, 99 percent defect-free. Controls are necessary to set boundaries on allowable behavior and also alert management to deviations from processes. “Processes are the ‘how’ part of doing business,” says Hess. “As businesses grow, the entrepreneur loses the ability to be hands-on with all aspects of the business. There is simply too much to do. So, the challenge is for the entrepreneur to increase the probability that others will do the tasks as he or she would like them done. To accomplish this goal, the entrepreneur implements processes. Growth creates business risks that must be managed. Growth stresses people, processes, quality controls, and financial controls. Growth can dilute a business’s culture and customer value proposition and put the business in a different competitive space. Understanding these risks is critical to managing the pace of growth and preventing growth from overwhelming the business. “To get a better handle on growth risks, consider how your strategic space will change as you get bigger,” says Hess. “You will probably enter a new competitive space, facing bigger and better competitors than you previously faced. Those new competitors may be better capitalized than you and be able to engage in price competition, driving down your margins. “I am not anti-growth,” Hess clarifies. “Growth can be good and growth can be bad—it depends. 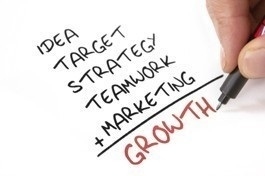 Aggressive, untimely, or poorly managed growth can hurt a business and even destroy value. And, in some cases, too much growth can lead to business failure. Don’t make growth for growth’s sake your business’s goal. Understand that growth, if not properly managed, can undermine the fundamental strengths of a business. Edward D. Hess is author of Grow to Greatness: Smart Growth for Entrepreneurial Businesses (Stanford University Press). He is professor of business administration and Batten Executive-in-Residence at the Darden Graduate School of Business, University of Virginia. He is the author of ten books, over 60 cases, and over 60 articles. For more information, visit www.EDHLTD.com.